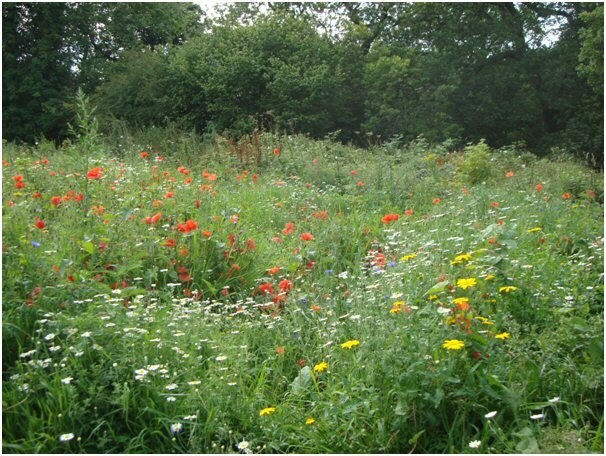 The idea of developing a wild flower meadow at Dibbinsdale, was born through many visits to the Yorkshire Dales* admiring the variety of colour, insects, birds etc which are an integral part of the meadow ecology. Together with the local Ranger, an area of amenity grassland outside the SSSI boundary of Dibbinsdale was identified for what was initially considered as a trial area. The trial site can be quickly reached from the car park with a walk way through the centre. 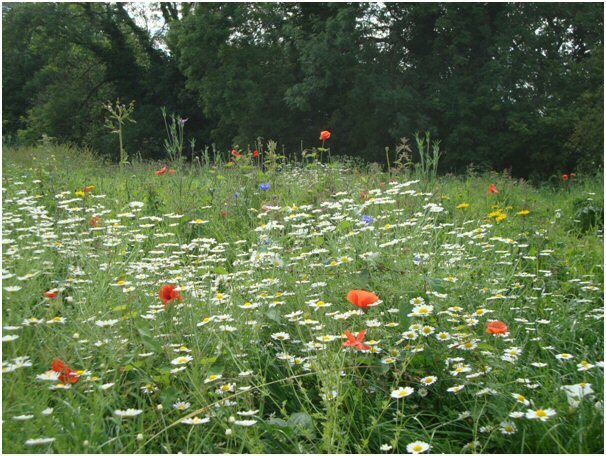 We then approached The National Wildflower Centre based in Merseyside to ask for their advice on the suitability of the site and their recommendation for suitable varieties of flower seeds. 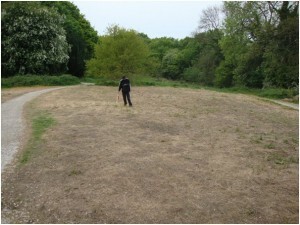 Fortunately the ground was considered sufficiently deficient of nutrients (a state necessary for wild flower meadows to grow), though the high concentration of weeds present would need to be removed. The volunteer team spent many hours strimming , mowing and raking the ground to remove the bulk of the existing vegetation. By early May 2011 the ground was pretty much back to the raw earth state ready for the seeds to be spread. The decision as to what variety of seeds should be used was recommended and bought through the Wildflower Centre (money kindly donated by the Friends of Dibbinsdale). We split the area into five patches with each patch taking a specific mix of seeds. The idea was to find the most successful mix and hence be the foundation for further sowing in the years to come. corn cockle, corn marigold, corn poppy, corn chamomile and cornflower. Heritage – consists of musk mallow, ox eye daisy, field scabies, wild carrot, ribwort plantain, betony, yellow rattle, cow slip and lady’s bedstraw. County Lane – agrimony, cow parsley, foxglove, hedge bedstraw, hedge garlic, lesser knapweed, meadow sweet, ox eye daisy. Downland Meadow – bird’s foot trefoil, dyers rocket, greater knapweed, lady’s bedstraw, kidney vetch, ox eye daisy, salad burnet, viper’s bugloss. Scottish Mix – devil’s bit scabies, field scabies, lady’s bedstraw, lesser knapweed, ribwort plantain, meadow buttercup, red campion, St Johns wort. Much to my disappointment, very little happened until mid August 2011 when a good spell of dry weather suddenly transformed two of the trial areas into an abundance of colour – what a relief! The most successful patch was sown with the Heritage and Downland variety (signature in both). By November the meadow has reverted back to a weed bed, we need to repeat the hard graft and remove the nettles and many other invasive weeds ready for the established wild flowers to blossom again in summer 2012 (some of the varieties used will only flower once). Together with our advisor from the Wildflower Centre we will then decide what resowing might be necessary. * The Yorkshire Dales Millennium Trust – as part of their development programme – is working with local farmers within the dales to reinstate the meadows which existed in the 1950s. The area has been mown and cleared. A fresh batch of seeds have been sown – bring on the Summer! 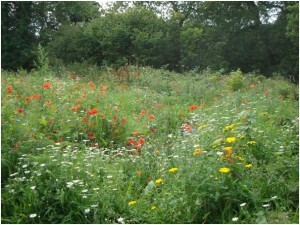 The Wild Flower meadow projects management was taken over by a member of the friends of Dibbinsdale, David Rome. It was recently mowed repeatedly, preparing for a new bloom of wildflowers.